Installing air conditioning in your home isn’t only about staying comfortable. It’s also a way to improve the indoor air quality which is essential for optimal !respiratory health. Please feel free to browse all of our HVAC info below and if your question isn’t answered below, just ask us. The technology has changed rapidly over the years. You are looking for HVAC info. We have answers. Take a moment to read our FAQ roundup to find the information you need. All the HVAC info that you are looking for can be found below. If not – ask us! What Are the Types of Air Conditioning Options? You have several choices when it comes to choosing the right one for you. Window units are the least expensive and offer a value-priced means of cooling a smaller area. A central air unit is a bigger investment, especially if you have to get ducts and vents installed too. It is a significant undertaking that may take several days to complete. One of your first choices is the location. If you’re going with central air, you’ll need to decide if you want the unit on the roof or in a split system. The latter is an excellent choice if you live in a sunny area. After all, if it gets hot in the sun, it’ll have to work harder to cool the inside of your home. The next thing to consider is the size. Your climate zone and square footage of your house are essential factors in this decision. Less isn’t necessarily more or vice versa. The BTUs you’ll need will vary if you live in Arizona or Minnesota. 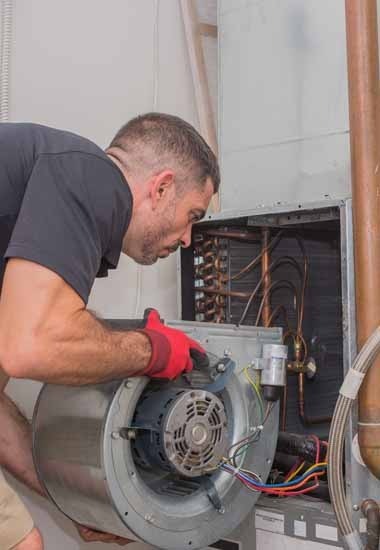 The rule of thumb is you’ll need a unit with a higher BTU output in places where it’s colder, especially if you’re installing an HVAC system since the heating element will do the bulk of the work. What Does It Cost to Install One? If you have a newer home, installing a complete HVAC system is a cost-effective way to combine both heating and cooling using the existing ductwork. However, it is expensive with costs ranging from around $2,000 to well over $5,000, depending on the brand, installation cost, and features. A cost-benefit analysis can help you determine which things are most important, given your situation and if it makes sense to upgrade. We’d recommend the last item no matter what central air system you get. The cost is modest, and it will pay itself off quickly with savings on your energy bill. No matter what type of air conditioning you get, maintenance is critical to keep your air conditioning running smoothly. How much you’ll need to do depends on your system. At the very least, you’ll need to change the air filter regularly as per the manufacturer’s recommendations. It’s a simple task yet an essential one. It prevents dust and other particulate matter from getting inside the unit and gumming up the works. It can also prevent allergens like spores and pollen from getting indoors with the airflow. We also recommend an annual inspection of the system in the spring or biannual with a fall visit if it is an HVAC unit. A technician can give it a thorough once-over to clean the components and check for any possible issues. It’s a small price to pay to prevent costly repairs down the road. That’s the million-dollar question in this FAQ section. You can expect to get at least ten years or more out of your air conditioning, depending on well you take care of it. Regular maintenance is the single best thing you can do to ensure the maximum lifespan of the unit. Often, small problems go undetected such as leaks in the ductwork. Sometimes it’s merely a matter of age. Parts wear out and require replacement. However, the entire system as a whole need periodic checks. For example, a leaky duct can cause the unit to work harder and less efficiently. And they typically get worse over time. You notice it first with higher utility bills. When you get it inspected regularly, the technician can identify problems before they become major hassles. An ounce of prevention is all it takes. Penguin Cooling and Heating is your go-to solution for any air conditioning installation, maintenance, or repairs. Our team of professionals are EPA-certified and maintain the highest standards of excellence in training and knowledge. All our work is 100-percent satisfaction guaranteed. Contact us today at 704-296-0800 or message us to answer all of your HVAC system needs.